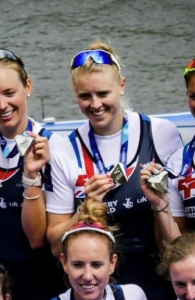 Gordon Associates is pleased to announce that we are sponsoring Holly Hill, a member of the GB Rowing Team. It is an honour for us to be associated with an athlete at the peak of her sport so please join us as the story unfolds. Click here to see Holly’s Calendar Of Events in the run-up to Tokyo 2020. Our third training camp of the season has brought us back out to Portugal to make use of the continued warm weather that can be found on the continent in February & March while the UK often endures some more rogue conditions! This time we are on Lago Azul, 2 hours to the north of Lisbon. Alongside the nicer weather, training camp also gives us the opportunity to escape the confines of our 2,000m course which, when you’ve got 20,000m to row can make you feel a bit like you’re forever spinning in circles! In addition, having all the facilities on site with no travel required means we can maximise recovery between sessions and therefore fit more training into the daily schedule. I’m going to give you a bit of an insight into a typical day on training camp – so you don’t think we’re just swanning off on holiday to sunny places 6 times a year! Usually we wake up at 6:30am and present for something we call ‘Morning Monitoring’ at around 6:45. This involves heading to the physiology room and filling in a spreadsheet with variables such as waking heart rate, body weight, quality of sleep and perceived shape. We also hand in a pee sample to check our hydration and finally have a small amount of blood drawn from our ear which is used to measure blood urea, an indicator of fatigue. We then grab some breakfast, stretch in the gym and finally head to the boats for a morning row. At home this would normally be around 16km but on camp we can extend it to 20km and the coaches can all come out on their own launches to follow us more closely and give coaching. We then have a couple of hours to refuel and get off our legs before heading back to the boats for a second session on the water. This will either be another steady paddle for around 16km or sometimes we get to fire it up and do some faster pieces! This is followed by lunch and a couple of hours off in the afternoon to chill and probably have a sleep! We then finish the day with a 90 minute weights session where we focus on core stability and rowing related strength work. For the most part I absolutely love being on training camps – we’re so lucky to stay in the beautiful places we do and it’s a great chance to absolutely nail our recovery strategy and get the most out of the days we have left until the Tokyo Olympics… 519 at the time of writing so I better get training! As ever, feel free to get in touch on instagram @holly.hill123 ! Hi everyone! I’m Holly and I’m currently a member of the Great Britain Rowing Team working my hardest to earn a spot on Team GB for the 2020 Olympic Games in Tokyo, Japan. I’m really excited to be partnering with Gordon Associates and am looking forward to sharing my international rowing journey with you. As you can imagine, there will be some ups and downs along the way but hopefully I can give you an insight into the life of a professional athlete chasing their 10 year old dream of competing at the biggest sporting event on earth! 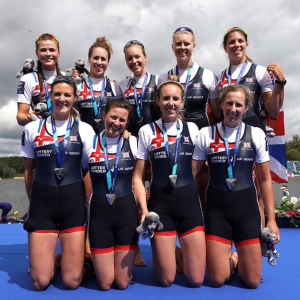 I was lucky enough to start my rowing career as part of the talent ID scheme ‘GB Start’ which followed the London Games. I picked up my blades for the first time in September 2013 and promptly let go of them again 30 seconds later as I capsized for the first time getting into my boat! I spent the next 4 weeks accidentally plunging myself into the cold water of the river Ouse in Ely almost daily. But despite the breathtaking cold water immersion I discovered a love of learning to master a new skill and an opportunity to challenge my resilience both mentally and physically – and I’ve never looked back. 2 years later, I found myself representing Great Britain for the first time on the international stage at the U23 World Championships. I was in the Women’s Four (four athletes, one blade each, two rotating to the left, two rotating to right) and amazingly we came home with a bronze medal. Today, 5 years on from that first capsize, I am a fully-fledged member of the GB Rowing Team, training 3 times a day, 6 days a week alongside 60 of the tallest men and women in the country! The national training centre is fantastic and comes complete with a crew room for eating and resting, a bunk room for afternoon naps (the best! ), a physio room, doctor’s office, weights gym and indoor rowing machine room (the absolute worst). It’s based just outside Reading but every 6 weeks or so we disappear off abroad to various training camp locations to escape the wind and rain of the UK and give us a chance to increase the mileage on some nicer water. This month we’ve headed out to Avis in Portugal for three weeks of tough winter training – as the Olympics draws nearer the volume of the training programme increases so fingers crossed I survive to tell you all about it next time! In the meantime, if there’s anything you’d like to know, I can be found on instagram at holly.hill123 so feel free to get in touch!